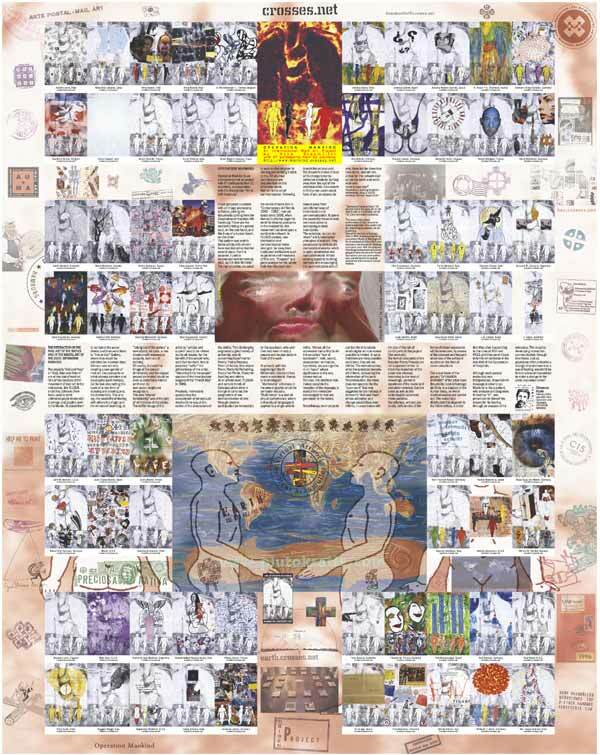 Operation Mankind is an international mail-art project with 67 participants from 21 countries1, in cooperation with the "Association Art in LBK Hamburg". This mail art project is exhibited in the Art Hall of the LBK Hamburg from 29. October 2003 until 20. February 2004. I have prepared a pattern with an image processing software, joining two documents coming from the Corporation of Hospitals LBK Hamburg. These are the medical printing of a patient card, on the one hand, and the X-ray of a human heart, on the other. This pattern was sent to fellow artists with whom I have maintained contact for several years. For this purpose, I use a determined mail-art method, ADD, ALTER AND RETURN2. The mail-art artists are asked to work on the diagram by altering and sending it back to me. All returned contributions are documented on this artistamp sheet. Mail-art is the art of communication. Following the words of Doris Bell in "Contemporary Art Trends 1960 - 1980", mail-art exists since 1916, when Marcel Duchamp began to send his ideas by postcards. In the meanwhile, this form of art has developed a world wide network. In FLUXUS context, new distribution and communication forms emerged, far away from traditional institutions such as galleries and museums of fine arts. "Fluxpost" is a good example for this, where both Ken Friedman and Joseph Beuys took part. The recurrent motive of mail-art is change towards collective creativity, turning away from the cult of the individual artist. It is a search to find a non-commercial form of art; an attempt to remain away from established ways of transmission and commercialization. It opens the possibility for world wide communication by surpassing cultural boundaries. "No selection, no jury, no return" are fundamental principles of mail-art. They accentuate its intrinsically democratic character, which is open, unselective and non-commercial. Artists working together, building contacts and encouraging the communicative side of arts, these are the ideas that have been, and still are, primal for the network mail-art on the earth and world wide web. 1 List of Participants "Operation Mankind"
3The scope of the artistic confrontation of Hans Braumüller encompasses from virtual poetry, mail art, networking art projects and net-art , to painting. Braumüller was born in Santiago, Chile, in l966. He grew up in Hamburg, completed a Master of Arts Degree in the Universidad de Chile (1991) and returned to live and work in Hamburg some years back. With this continuos interchange between two cultural and geographical worlds the artist himself has become part of a cosmopolitan web, expressing with his projects experiences that transcend cultural frontiers.